Click on flyer to enlarge for details! England takes on Portugal. 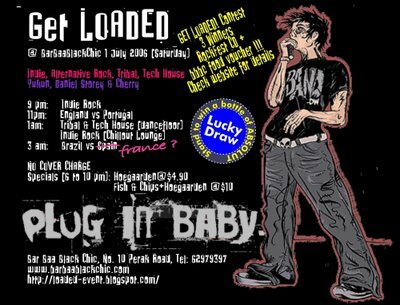 Before we screen the match "live" at 11pm at Barbaablackchic, we're going to get into that oh-so-Brit mood with the sounds of LOADED! Good old Brit indie, alternative rock and a general jangly vibe from 9pm - 11pm. Then there's the mighty Brazil taking on France at 3am... it's going to be a long night! If you are not into balls... there's always the chillout room! No cover charge. 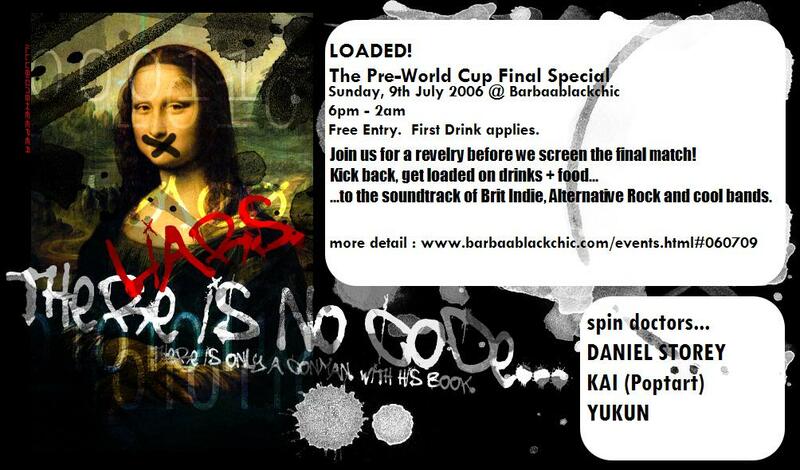 Come as you are and join in the revelry with resident Daniel Storey (UK), Cherry and Yukun. ... something different for the usual. Visit above blogsite for details and contest. Or visit the hosting venue site HERE. p/s The current streaming mix from P@t will not be made for download. It will be available as a limited 20 CDRs giveaway during this coming Progressions... during his set. Yukun is also working on a new mix CDR for this event. Stay tune!!! Entry by guestlist before 12 midnight. Email Progressions with your FULL name (as appears in your ID card) and the names of your friends coming with you before the end of 8 June 2006 (Thursday). No guarantees as guestlist availability is very limited. You are added once you get a confirmation reply from them. First come first serve.